You’ve all heard of “superfoods,” and while nuts, yogurt and acai are certainly healthy, like the overachievers in high school, you’re probably tired of hearing about them. There must be power-packed foods we can eat when we want something meaty that doesn’t look like it belongs on a spa menu, right? You’re going to eat my what? 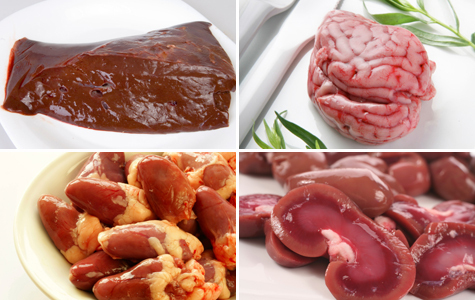 If you’re looking for animal-based wonder foods, look no further than the organs. In nature, most animals go straight for the liver and kidneys after a kill, plunging into the muscle and meats after. While the idea of eating guts might seem vile, it’s ultimately no different than eating an animal’s outer muscles. The organs offer some of the densest sources of nutrients like B vitamins, iron, phosphorus, copper and magnesium, and are rich with the most important fat-soluble vitamins, A, D, E and K. Consider yourself on the cutting edge of healthy nutrition (not Hannibal Lector) for digging into foods like heart, brains and tongue. Prepared right, they’ll make you feel more like a guest at a four-star restaurant than a contestant on Fear Factor. Since it’s a muscle, heart shares many similarities with steak, roasts and ground beef, is less expensive (probably because people won’t eat it), and has a higher amount of protein, thiamine, folate, selenium, phosphorus, zinc, CoQ10 and several B vitamins. It’s a great way to rack up amino acids that can improve metabolism and compounds that aid the production of collagen and elastin, which fight wrinkles and aging. This mixture of unique nutrients helps build muscle, store energy and boost stamina and endurance. Beef heart should be a deep reddish brown, with a layer of fat near its top. Like most organs, heart is delicate and should be cooked slowly and served medium rare. Cut away the fat, connective tissue, valves and tendons, cut it into slices, salt it and soak it in an acid-based marinade for at least an hour to tenderize it and release those delicious flavors. Grill the slices and serve with a vinaigrette. Prepare chicken hearts the same way (except you don’t have to butcher them). You might notice extra energy immediately after you eat. One of the most common organs, liver is a great source of high quality protein and is one of the most concentrated sources of vitamin A, along with copper, folic acid and iron. It also contains Coenzyme Q10 (CoQ10), which is important for cardiovascular functions. Athletes love liver because it improves the oxygen-carrying capacity of blood cells, increasing endurance and strength and fighting fatigue, while its B vitamins aid people with Alzheimer’s and other forms of dementia. 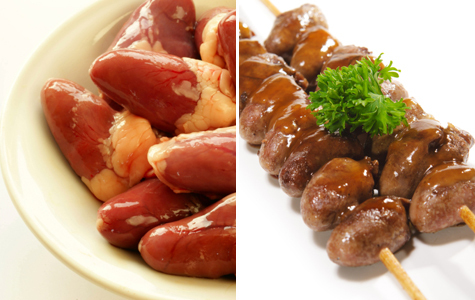 Liver is commonly enjoyed in cuisines all over the world: in the South, they deep-fry chicken livers; in Germany, they feast on liverwurst; and in Japan, they use raw fish liver to make sashimi. Opt for beef, veal, goat, lamb, bison, buffalo, chicken, geese or duck liver, preferably from a young animal (it might appear more pale), which is most tender. The only thing off limits is polar bear liver, which, because of its high density of vitamin A, can cause drowsiness, irritability, bone pain, vomiting and even peeling skin. Liver can retain toxins from drugs and other chemicals, so buy grass-fed meat without added antibiotics or hormones. Soaking in lemon juice or milk for several hours before cooking reduces liver’s strong metallic taste. Sear it until it’s light pink and top with caramelized onions. Cooking too long can make liver tough or rubbery, and releases many of the nutrients and digestive enzymes. Zombie jokes aside, eating brains is a tad controversial. It can contain prions, a type of protein that has been liked to mad cow disease, and more cholesterol than any food (2,000-plus mg in a 4-ounce serving.) But it’s also one of the most nutrient-rich organs found in any animal, full of healthy oils rumored to increase brain power. That’s due to the DHA found in brains, an oil that, when eaten in childhood, is thought to make people smarter in adulthood. 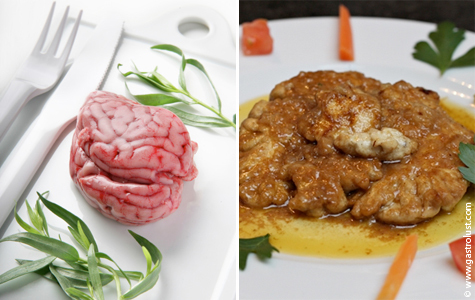 Brains also are a great source of B12, which helps fight fatigue, depression and anemia and increases mental ability. Beef, lamb pork, pig, rabbit, etc. Brain is often served lightly dredged in flour and sauteed. First remove any veins and the film around the brain. Soak in water for several hours, changing the water hourly. Quickly blanch the soaked brains in boiling water, then toss in flour and sautee them in butter until they’re golden brown. People also cook them in stews, poach them, scramble them and even slice them in sandwiches. If you’re looking for a way to get lots of protein without lots of fat, opt for kidneys, which contain a pissload of B12, riboflavin and iron, as well as healthy amounts of B6, folate and niacin. 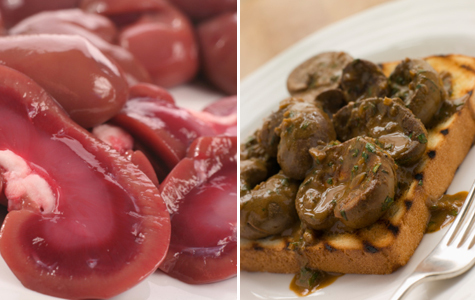 Kidneys are usually consumed in beef, lamb and pork form, but if you’re just easing into eating them, we suggest trying beef kidneys, which have a milder flavor. They’re also the easiest and cheapest to prepare. The best kidneys are plump, glossy, and free of discoloration or strong odors. 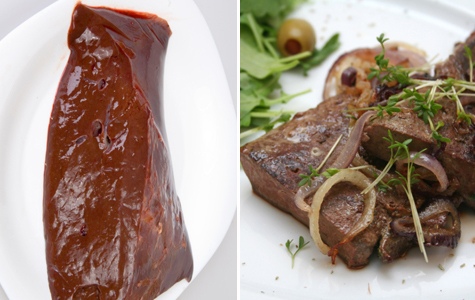 Choose kidneys deep red in color, unless you’re going for veal, which look more tan. Rinse them in cold water, remove the outer membrane and slice them in half (if you don’t want a strong flavor, you can soak in water for a few hours with some salt). They’re often sauteed with butter and olive oil, but also commonly baked into kidney pies or casseroles. There are two things deceiving about the name “sweetbreads,” as they are neither sugary desserts nor bread. (They are slightly sweet tasting, and “bread” goes way back to an old English word for “flesh.”) What they do contain is plenty of proteinnot to mention fat and cholesterol. They’re made from either the thymus gland or pancreas from a calf or pig, and they’re dredged in flour and sauteed in butter until golden brown and slightly crispy. 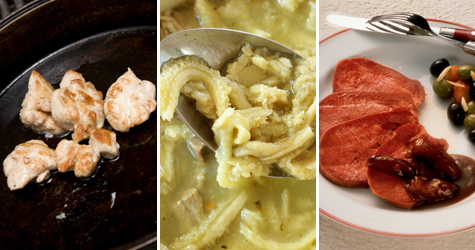 While it looks like something living in the back of your refrigerator (thanks to the “honeycomb” texture), tripe has been considered a delicacy ever since the Grecian days. (Homer wrote that it was prepared in honor of Achilles.) 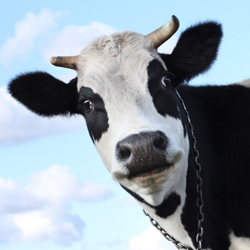 The most common type is reticulum, the honeycomb variety, which comes from the second stomach of a cow. There’s also the rumen, or blanket/smooth tripe, which comes from the first stomach. Once you get past the gamey taste and chewy texture, enjoy the fact that you’re getting loads of high-quality protein, and a good amount of potassium and other healthy minerals. Tongue is another organ packed with B vitamins (especially B12). The most common forms are beef and veal tongues. Most tongues share a grainy, firm texture and pinkish-grey color. Stew it, boil it, roast it, poach ityou can even pickle it.